The Princess Royal has visited Ghana to mark 60 years of Ghana's independence and celebrate the strength and depth of UK and Ghana relations. During the visit The Princess Royal undertook a wide-ranging programme that focused on projects that empower women and support female education and entrepreneurship. The visit got underway with Her Royal Highness attending an audience with The President of the Republic of Ghana, Mr Nana Akufo-Addo, at his official residence, Flagstaff House. 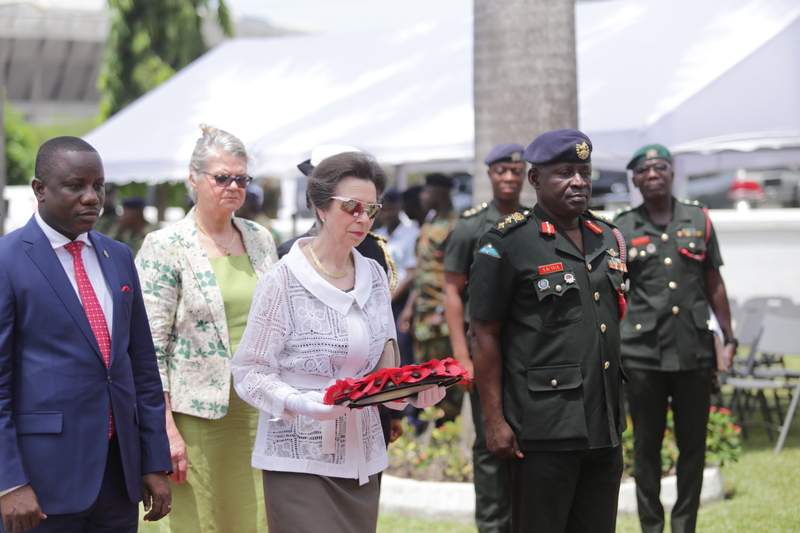 At Christiansburg War Memorial The Princess Royal commemorated links between the UK's and Ghana's Armed Forces, where she laid a wreath and signed the Book of Remembrance. The British Council in Ghana supports a number of educational projects and Her Royal Highness had the opportunity to visit a number of these programmes and meet those who have benefitted. The Varkey Foundation is able to deliver quality education to thousands of children in rural areas through an innovative distance learning programme. The Princess Royal took part in a video conference lesson where she was introduced to four different schools that have benefitted from the initiative. This year marks 60 years of Ghanaian independence and in celebration Her Royal Highness attended a garden reception at the British High Commissioner's residence. The next day started with a Durbar, which is a traditional Ghanaian welcoming ceremony which includes dancing, music and presentations of tribal leaders. 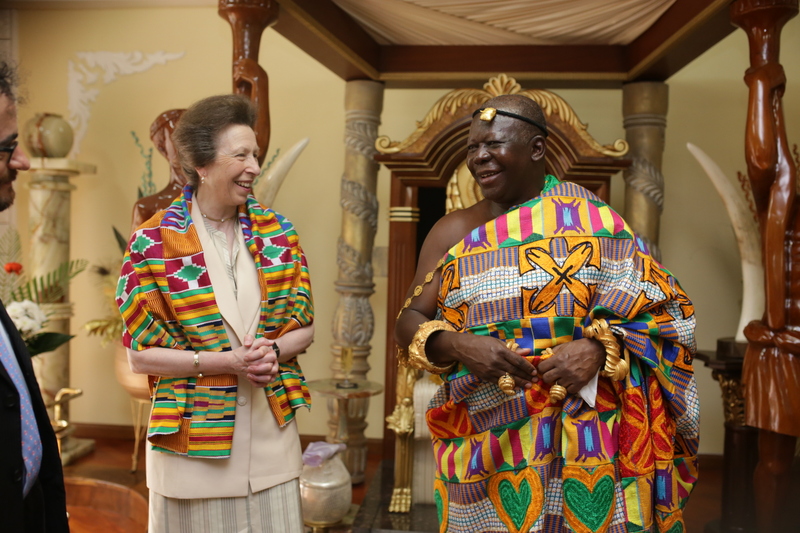 After the ceremony The Princess Royal met and had an audience with the Asantehene, His Majesty Otumfuo Osei Tutu II at the Manhyia Palace. In Kumasi Her Royal Highness toured Gods Heritage Academy to see how the charity Opportunity International UK, of which she is Patron, is enabling people to unlock their potential. The Princess Royal is also Patron of the Voluntary Service Overseas (VSO). At Wesley College of Education Her Royal Highness had the chance to meet some volunteers and see first-hand the work that is being achieved to improve education. 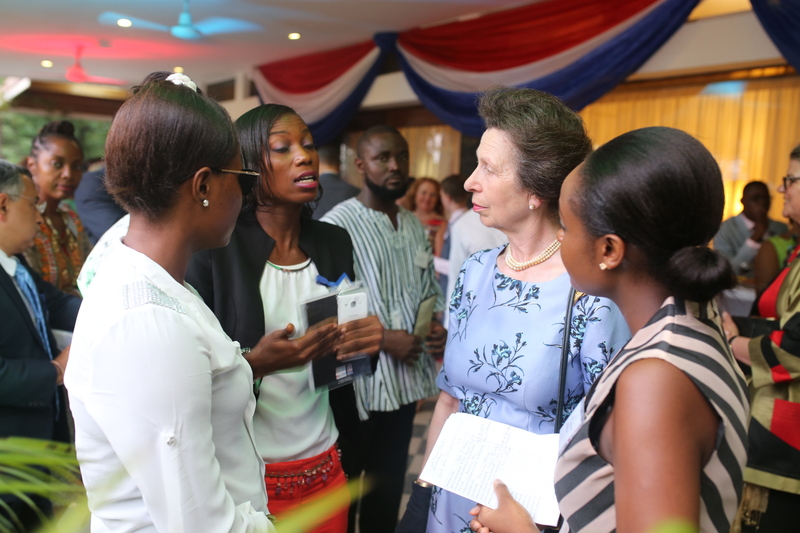 This was The Princess Royal's third visit to Ghana, having previously been in 1998 and 2011. Her Royal Highness will continue her visit to West Africa in Sierra Leone.